3 kg of dried organic certified seaweed which contains brown serrated Kelp (laminaria and Fucus vesiculosus) Suitable for your garden. Hand harvested from the north coast of Ireland. Dried slowly in a traditional manner to a moisture content of less than 20% (not heated or microwaved to high temperatures) ensures nutrients remain in the seaweed. Dried seaweed will keep up to two years. 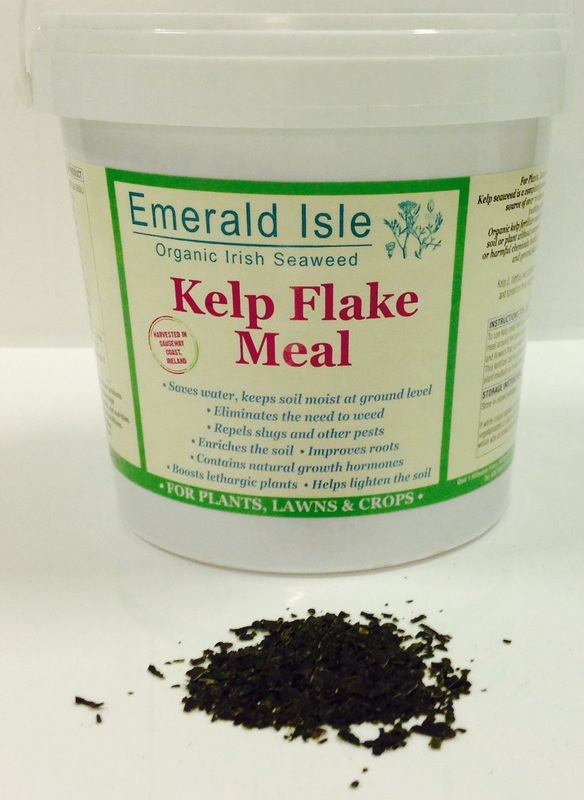 Organic Kelp Meal Fertilizer 3 kg. 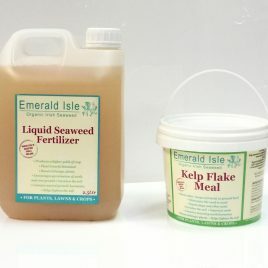 The benefits of kelp meal fertilizer for your plants are that it is a completely natural, organic product and a source of over 70 vitamins and minerals. For this reason, it is an important dietary supplement for a terrific organic fertilizer. Organic kelp fertilizer can be applied to any type of soil or plant without concern for waste by-products or harmful chemicals, leading to healthier crop yields and general plant well being. The purpose of any mulch is to keep garden soil from drying out at the surface. By preventing moisture from evaporating, mulch reduces the need for watering. The practice of mulching is essential in areas where conditions are hot and dry. Eliminates the need to weed your garden. Mulch covers the soil and blocks new weeds from sprouting. This is because the soil beneath the mulch remains moist, any weeds which do manage to sprout through the mulch are easy to pick. Slugs are immediately repelled by two things, salt and sharp-edged materials i.e. chopped dried seaweed. Seaweed has a natural salt content which repels slugs. Slugs do not like “crispy” surfaces, as the sharp salty edges cut into the soft body tissue. While some mulches may provide hiding spots for slugs, earwigs and other pests, seaweed mulch does not have this disadvantage. Kelp seaweed is a broad spectrum fertilizer that is rich in beneficial trace minerals and hormones that stimulate plant growth. Kelp seaweed is high in carbohydrates which are essential building blocks in growing plants, and low in cellulose so it breaks down readily. Seaweed shares no diseases with land plants. Compacted soil can benefit as seaweed mulch breaks down. As the material becomes incorporated into the soil, aeration is improved and the soil becomes more crumbly and moist. Does not contain weed seeds, unlike bark mulch. Seaweed does not bring any foreign weed seeds into your garden. 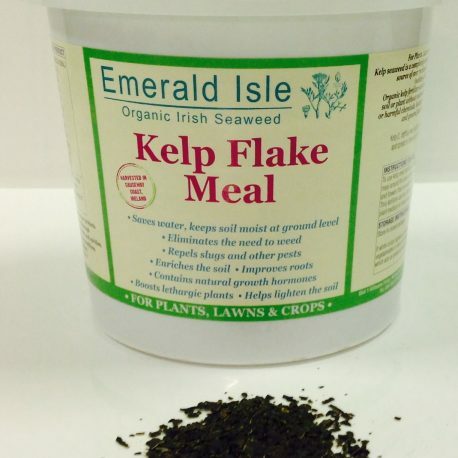 Kelp seaweed fertilizer contains an abundance of fully chelated (ready to use) micro-nutrients which can be readily absorbed by plants without any further chemical decomposition needed. 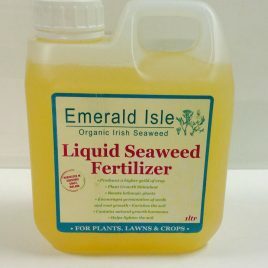 Kelp Liquid Seaweed Fertilizer for Plants, lawns and Crops. 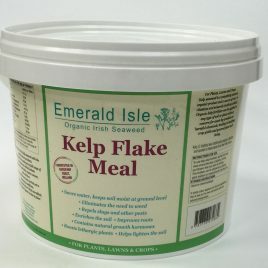 1.5 kg of dried organic certified Kelp seaweed which contains brown serrated Kelp (laminaria and Fucus Vesiculosus) Hand harvested from the north coast of Ireland. 6 kg of dried organic certified seaweed which contains brown serrated Kelp (laminaria and Fucus vesiculosus) Suitable for your garden.